A shift is occurring in the balance of power between retailers and brands, with brands likely to carry more inventory risk as open-to-buy budgets are squeezed, analysts say. The change comes as retailers are increasingly placing orders at the last minute and managing inventory with more caution in a bid to lower markdowns. But this is, in turn, is putting pressure on brands to hold more inventory, and means they carry inventory risk longer than in previous years. "Increased inventory exposure among the brands can impede cash flow generation and increase margin risk while also placing a higher reliance on brand direct-to-consumer (DTC) segments to absorb volume dislocation whether it has the capacity to do so or not," according to Cowen & Co analyst John Kernan. "Aside from top-line pressure this scenario can create, higher inventory balances equate to higher markdown allowances, lower margins and greater working capital drags on free cash flow." "During 2016, price-to-earning ratios have expanded on average for retailers, versus multiple contraction for the brands, as the debate over brands versus retailers takes a new turn," Kernan says. According to Cowen, the inventory-to-sales spread, including forex, mostly showed quarter-on-quarter sequential improvement, led by the sporting goods, off-price and sneaker retailers, along with the athletic brands. 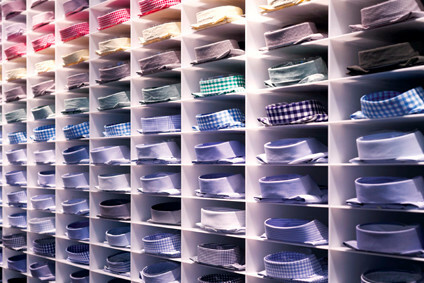 Apparel brands are seeing signs of self-correction on inventory but the analysts believe there is still more work to be done. "There is a shift in the balance of power among the retailers and the brands due to sales and inventory performance of the last 12 months and rising competitive pressure from brand-owned DTC concepts," Kernan explains. "The balance of power is currently favouring the retailers after many years of brands controlling the supply chain." In comparing the percentage change in price-earnings ratio multiples of branded apparel and footwear manufacturers versus retailers, Cowen found the brick and mortar retailers, which sell merchandise often exclusive to their stores and provide the customer with a unique shopping experience not found online, experienced around a 7% expansion in price-earning multiples from year-end 2015 to 2016. In contrast, the branded apparel and footwear manufacturers experienced, on average, a 4% contraction in multiples over the same time frame. "The brand over retailer trade has been unwinding this year with more rough patches to potentially get through," Kernan explains. "Near-term expectations for third-quarter/autumn 2016 earnings performance within the branded apparel and footwear space is not overly favourable as September was still quite warm and inventory realignment is still playing catch-up," he adds. "The next catalyst to watch for is November temperatures. If temperatures turn colder starting in November versus last year this could potential trigger a cold weather reversion trade."